Who among us does not have some experience, in some way, with addiction? For the few Americans who can raise their hand to that question, my best advice is to count your blessings today and to not bet on that winning streak continuing tomorrow. I bought an important book last year, then actively avoided reading it. I didn’t want to read it. I knew the ending already and I knew it was sad. But much like life, the journey itself is what makes this book remarkable. Dreamland is a book written by journalist and award winning author, Sam Quinones. If any story can make sense of our nation’s current drug scourge, this is it. It is “The True Tale of America’s Opiate Epidemic,” and the “true” part of the subtitle is the key. This is a descriptive of a perfect storm of events, schemes, and weaknesses that have led our culture to a catastrophic state. It depicts a journey that is a departure from the stereotypes of ganglands, and big city junkies to the Midwest and the suburbs. No longer is black tar heroin, and its prescription partners of the same opium derivative, a dangerous drug only sought and used by select few in select places. These drugs are wrecking communities coast to coast now, and Quinones expertly explains how. Innovation in pain management in the pharmaceutical industry may only be matched by the innovation in the illegal drug market. Pharma convinced many doctors that it’s new drugs, particularly Oxycodone, were less addictive, or even not addictive at all. Simultaneously, the new wave of Mexican heroin dealers began distributing its product using technology, and a commitment to a nonviolent business model. The drug dealers began delivering heroin like pizza. Painkiller-addicted suburbanites began realizing heroin was easier and cheaper to get than the pills. And the combination turned the Heartland into Dreamland. The name of the book comes from a pool and recreation area in Portsmouth, Ohio where a few generations of the town’s people grew up. It has since been paved over and is gone forever in the aftermath of the epidemic that destroyed that town. 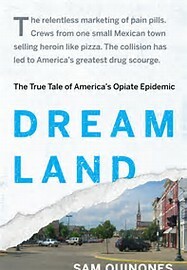 For me, Dreamland will now be the place where a drug induced fog is crippling the remnants of the American dream. I hope our collective recovery causes that vision to fade. Obviously the story of the book is not complete as we continue to struggle with the fog. I hope Quinones will write another installment ten years from now and I hope some of our changing perspective will lead us to a better place. Recovery from things like this is possible. It happens for individuals and families every day. So why not neighborhoods, towns and larger geographic areas? These days, it has become popular to treat addiction more as a public health problem and less like a crime. I think that is a productive shift. Americans know the roles that supply and demand play in any economy as well as any people. The “war on drugs” was unsuccessful largely because it was focused on eradicating the supply while ignoring the ever present demand. With public policy and sentiment shifting toward the demand side of the problem, outcomes may change. Attacking demand is delicate though. It is difficult to see addressing one’s attraction or desire to use heroin as a dilemma, but other kinds of demand issues in the world of addiction cloud things. Much of our heroin problem grew out of our legal consumption of prescribed medications. The medical community is now slowly addressing the role its over-prescribing played in the crisis. Many will evaluate the shift in mindset and conclude that this scourge is different not because people are dying, but because of which people are dying. The distribution network of heroin today is entrenched in every city, and the profitable suburbia each city has. These people are richer, whiter and actually never thought this could happen to them. It no longer is the African American problem that crack cocaine was in the eighties, or even the more recent rural plight that methamphetamine still is. The opiate wave has eliminated the thought that any class is immune to addiction’s reach. Our newest battle is challenging us to think of applying recovery methods to entire communities, and not just individuals and families. Those already familiar with recovery may become our greatest assets as this new chapter begins. Portsmouth, Ohio is turning the corner. I hope Scott County, Indiana is as well. Dreamland is not a bedtime story or an oversized town park anymore. It is a book that details our sad journey into the dark. I believe it describes rock bottom, which is a sight that can lead to healing. Don’t know how to answer my opening question? Reading this book will help. Previous Legislature, what will your verse be?